Sometimes a disappearance can be more haunting than an apparition. 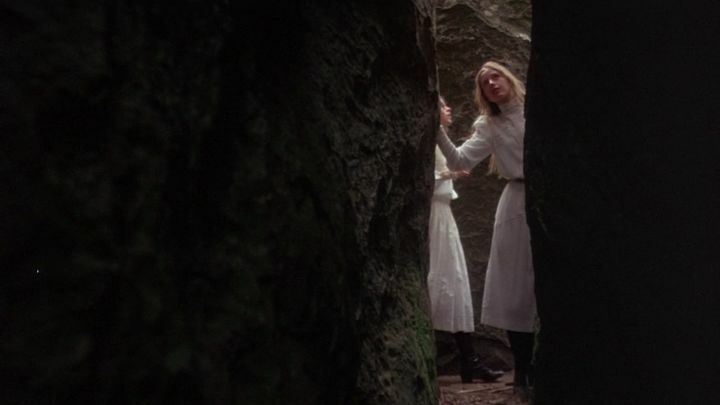 Nowhere is this clearer than in Picnic at Hanging Rock, which I watched again for the first time in a while last week. Picnic at Hanging Rock is the exemplary study of disapparition in cinema - I know of no other major film which deals with unexplained disappearance. One of the fascinating aspects of Picnic at Hanging Rock is the way in which it generates 'reality-effects'. Although Joan Lindsay's novel was entirely fictionalised, it was widely , though mistakenly, believed to be based on a true story. Why did this happen? The film's trick involved re-telling the classic Fairy story - young women abducted into an Other world - using the conventions of realism. One of these conventions was giving the events - or non-events - a precise date. An opening caption tells us that the three women disappeared on February 14th, 1900. 1900, significantly, is the year which Freud wanted The Interpretation of Dreams dated (this dating is, famously, fictional: Freud's text was actually published in 1899, but he wanted it to bear a more epochal date). But Picnic at Hanging Rock is not set in our 1900, for February 14th fell on a Wednesday, not a Saturday. Nevertheless, the use of a date (albeit a wrong date) would have been sufficient in itself to induce a 'reality-effect'. The effect that this excision produced can be linked to the lesson Lacan draws from the story about the painters Zeuxis and Parrhasios. Zeuxius painted a bunch of grapes so convincing that birds attempted to eat them. Parrhasios, meanwhile, painted a curtain, which Zeuxius asked him to pull aside to reveal what he had painted. The removal of the last - explanatory - chapter transformed Picnic at Hanging Rock into the fictional analogue of Parhassios' painting. It became a veil, an enigma whose very irresolution produced the illusion that there must be something behind the curtain of fictionality. A realist fiction becomes a fiction that screens the Real; i.e. which reveals the Real as an absence, as something that can only be encountered indirectly, via intermediaries. The central event in Hanging Rock is this 'Nothing' irrupting into the consensual hallucination of everyday empirical reality, leaving only a gap, a puncture wound: Nothing happens. In passing, it's worth remarking that the film strikingly brings out the inherent Surrealism of the colonial project. The boarding school looks like some Magritte excrescence. The elegantly stifling absurdity of the clothes, architecture and rituals, imported into a landscape whose very scale - temporal as well as spatial - mocks them, appear not only geographically, but ontologically out of place, an invasion from another world. 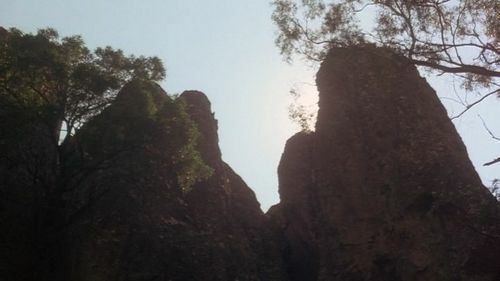 Hanging Rock broods like one of Dominquez or Ernst's decalcomania spinal landscapes; the incursion of an unassimilable Deep Time, a time that preceded the arrival of human beings by many millennia ('Waiting a million years, just for us'). Stefan Gullatz persuasively argues that Hanging Rock stands in for 'Das Ding', the Freudian Thing, that which resists all attempts at symbolization. As the object elevated to the site of Das Ding does not exist 'in its own time', but only materializes a void of non-meaning, an approach to this object in a realistic time frame would ultimately reveal its nothingness. A very slow or precipitous approach, however, facilitates the perception that the object has been missed, and therefore possesses an objective, empirical existence. Miranda (in a near-paraphrase of Poe): What we see and what we seem are but a dream, a dream within a dream. Marion: A surprising number of human beings are without purpose, though it is probable that they are performing some function unknown to themselves. Miranda: Everything begins and ends at the exactly right time and place.